Counting is a basic skill all children need to learn. Often this is done with workbooks or worksheets. However, I would like to propose more engaging ways to teach counting skills to little ones. The first concept I would like to suggest is using everyday experiences to teach basic counting. Whenever an opportunity presents itself to count with your child, take advantage of it! For example, help your child count the spoons needed to set the table for breakfast. When coloring, count the crayons in the crayon box. While taking a walk, collect and count rocks found on your path. During clean-up time, count the balls as you put them away. Utilize these everyday moments to incorporate counting into your child’s everyday activities. Manipulatives are a great way to teach basic counting in a more controlled situation. Rather than using everyday objects throughout your daily activities, you can use manipulatives to achieve the same results. Some fun manipulatives to help with basic counting include colorful counters or disks. Or, the manipulatives could be as simple as building blocks. Simply sort and count the objects with your child. 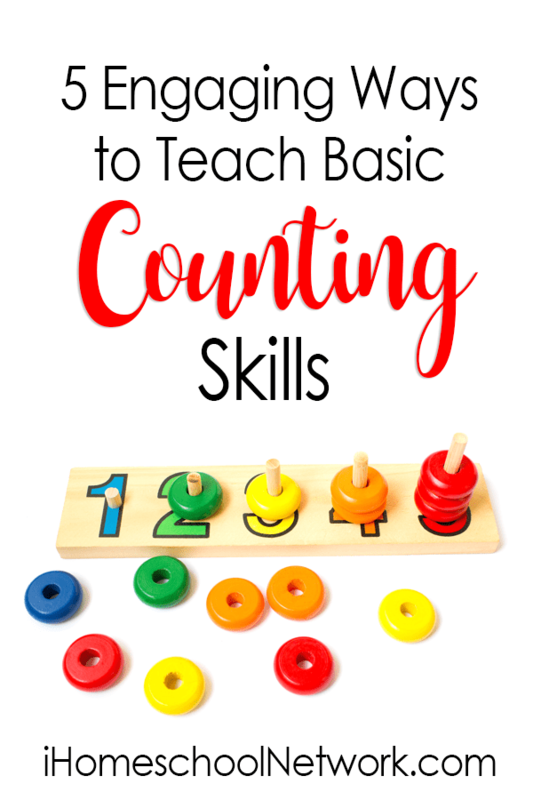 A fun, hands-on way to teach basic counting is to incorporate games. We played games such as Hi Ho Cherry-O a lot! I found with my own young children that they seemed to grasp concepts quicker and more comprehensively when the instruction was not forced, but was “taught/learned”behind the guise of something fun, like a game! My boys were very active and I found it beneficial to incorporate movement into the instruction. For example, when my children were young, I often used Education Cubes to help teach counting. My boys would roll (throw) the numbered cube and then jump that many times. The action of these types of kinesthetic activities kept my little guys engaged and interested in participating, which meant continued counting practice! Who said books are just for reading? Why not use books to help teach basic counting as well! When vibrant colors and fun illustrations combine with mathematical instruction in the form of a book, you definitely have the makings of a great living math book! We read lots of counting books and many of them can be found in my collection of books about counting. So, when it comes to teaching little ones to count, rather than reaching for a workbook or worksheet, consider a more engaging approach and try adopting some of these ideas instead. Hi there! I'm Jennifer (aka Mama Jenn). I am a homeschool mama blessed with five wonderful children, including one princess and two sets of twin boys! When I'm not busy with my family, I enjoy sharing educational activities, crafty ideas, FREE printables, and lots more on my websites!